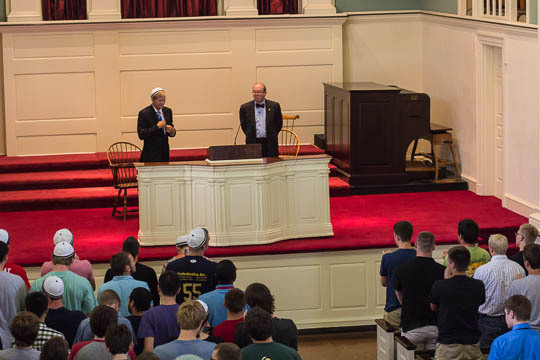 President Greg Hess kicked off this year’s Chapel talks with a “What I am thankful for Wabash” talk. I won’t tell you any more – you need to tune into YouTube to watch for yourself. He was short, to the point, and RIGHT ON! That earned him the coveted Standing “O” as well. Look for the “THE” – you’ll like it! But don’t take my word for it – go to YouTube. Andrew Dettmer, Class of 2015, was the student orientation leader, working alongside Heather Hines to make the entire program come together. 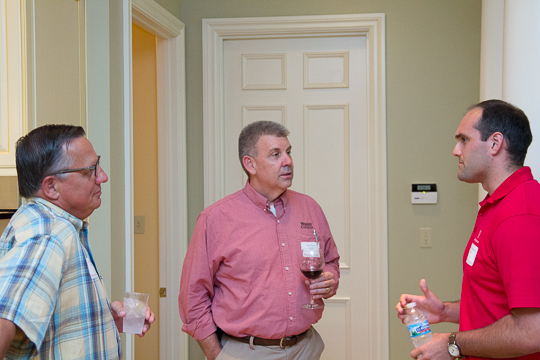 President Greg Hess and his lovely wife Lora caught up with Andrew before things got really moving. 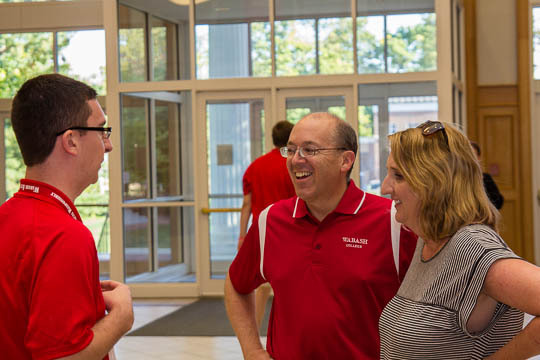 Wabash welcomed all 245 new students to campus – congrats Andrew and his team!!! 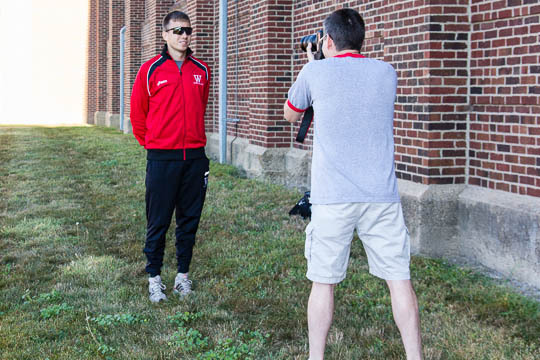 Just before Freshman Orientation started, I caught up with Jim Amidon ’87, Wabash’s Chief of Staff and Director of Strategic Communications, as he was taking the photos of this year’s Cross Country team. The crew all sported sunglasses….for a large % of them it was the same sunglasses. So I had to do the dumb thing and ask. Tradition, of course, was the answer. The dudes look tough AND cool with the glasses. I get it…a culture of tough, cool, and competitive. Guys you’d say are seriously competitive. 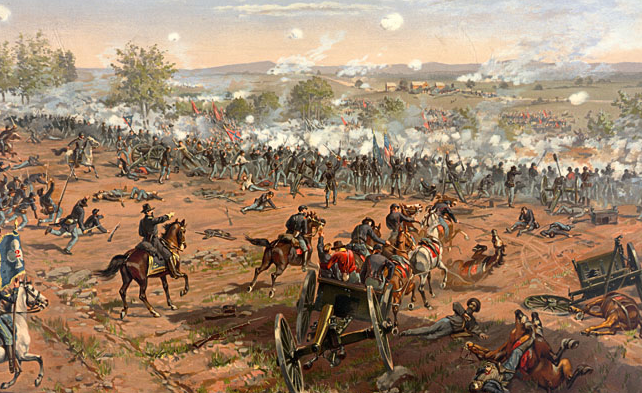 Ever wonder about the roles Wabash men played in the Civil War? Here’s the link to find the number of Wabash men who fought in the war and a way to get even more information. Thanks to Art Baxter ’56 for the link. The following information comes from good friend Chip Timmons ’96 in the Admissions Office. The Admissions Office and the NAWM Board will host 3 alumni volunteer workshops on campus this fall. 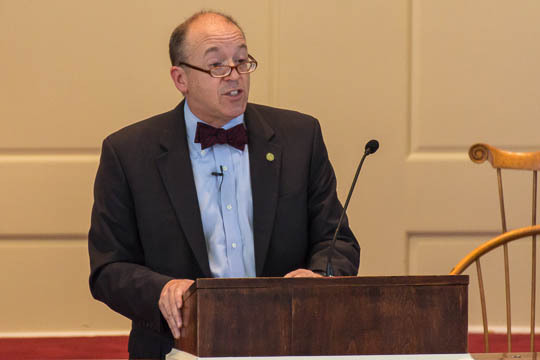 The workshops will provide attendees with all of the tools necessary to identify and recruit future generations of Wabash men including roles volunteers can fill, reports on current recruitment strategies, updates on new academic and co-curricular programs, and materials for your recruiting arsenal. The workshops will be held on the mornings of home football games. Workshops are scheduled for September 14, October 19, and November 9. Each workshop will begin at 10:00 AM and conclude at 11:30 AM allowing attendees plenty of time to tailgate or hit the bookstore prior to the game. Refreshments and lunch will be provided. Plan to get back to campus and take in the latest news. Email Chip (timmonsc@wabash.edu) to let him know you would like to attend. I remember many a football game watching DJ play – he was driven. Driven to be the best and driven to give his best. A lot of hard hits, followed by that great smile and a “hand outreached” to help the opponent up. Fast forward a couple of years and click on the video link. That’s the same DJ…driven. Same energy…same determination…same everything. 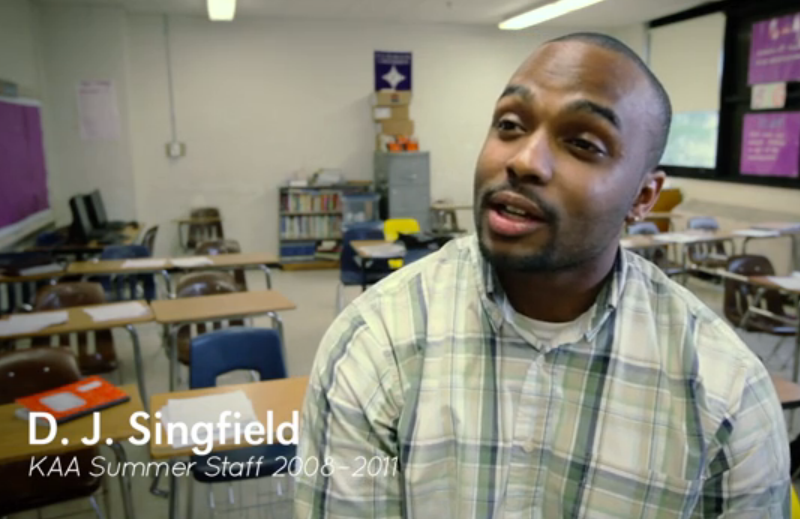 Passionate about giving his best…as a teacher. Albert hails from West Lafayette, Indiana. He’ll be here in 8 days for Freshman Saturday. 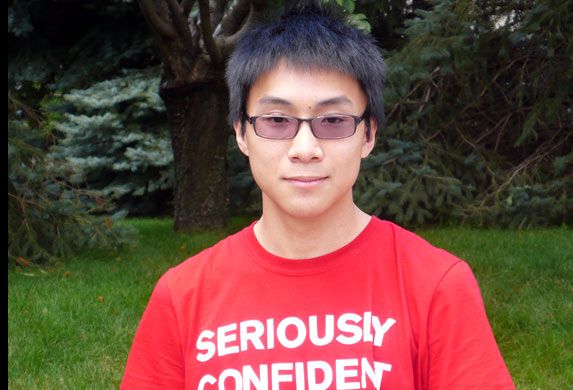 He picked the seriously confident look. Grunge can’t help but wonder if that gets tested, just a little, next week. Check out the new freshmen on the Class of 2017 page. Here’s the question – This year’s Wabash Freshman class was born in what year? So, my young son, Wabash Class of 1994, was an alumnus the year before this latest class was born! 1. The first Gulf War – what? 2. John Kennedy and Ronald Reagan – studied those names in History class! 3. Watergate – an old apartment complex in DC, right? Beloit does a yearly list that’s fun to read. They don’t have the 2017 list up yet, but here’s the link to last year’s list. By the way, those young Wabash men, Class of 2017, will be here in less than 10 days. It’s a new tradition. 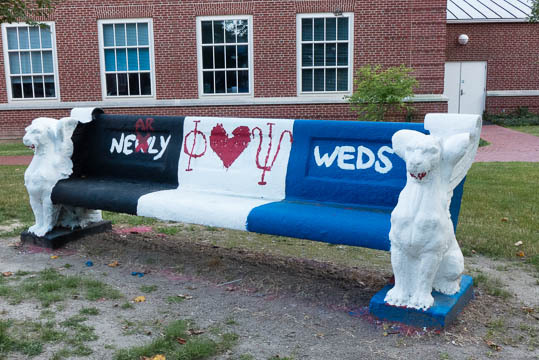 Over the past couple of summers, Wallies getting married have written their marriages into the history of Wabash by painting the senior bench. I think this is cool. 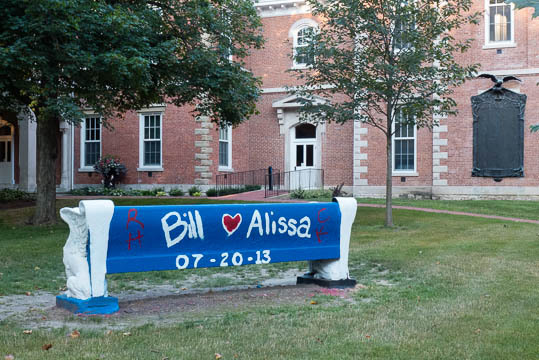 But, in a couple of weeks the season turns from summer wedded bliss to football…and the bench will be red! “Booger” was there. “Chainsaw” was there. So were “Too Kool” and “Scowler”…and “G-man” and “Mo” and “Hoss”…and others. The Bolar reunion was a hit. Bolar = our flying call sign. 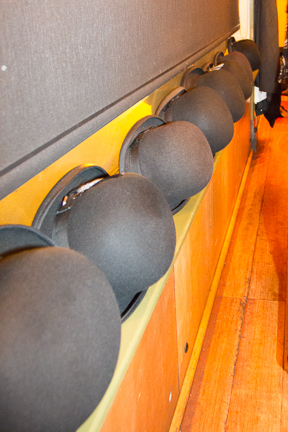 Bowler is the hat of choice. It’s tradition. The 492 Tactical Fighter Squadron, nickname the “Madhatters”, wears a “lid” from the hosting country. England = bowlers. 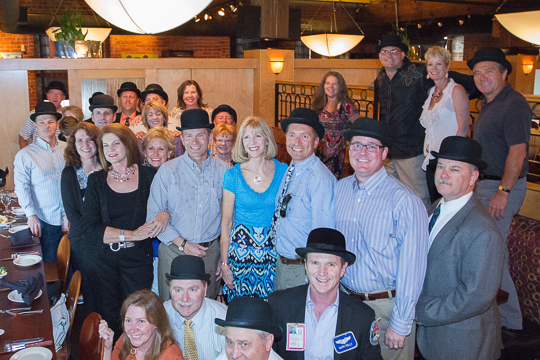 Rule: better have your bowler on at a formal squadron party or your tie gets cut off. No problem this time – as you can see from the lineup. Note: just like Wabash guys, Bolars marry well above themselves. Once again I was reminded of the importance of reunions. All of the pre-reunion worries melt away in 13 nano-seconds. You’re back together again and that’s all the counts. Best IP? Worst pilot? FWIC WSO? Top Gun? Rank?None of that matters at all. What matters are the friendships developed in a land 3,000 miles away and over 20 years ago. Those memories all come flooding back. So, Wabash friends. When it’s Big Bash time, think about coming back for the simple reasons of a place that changed you and the people who made that same trip and have been friends for life. That’s all you need.